In many cases, diabetes affects the functioning of your kidneys. If your kidneys are unable to filter your blood properly, your nephrologist may recommend dialysis – a treatment used to filter and clean your blood outside of the body. In order to receive this treatment, “vascular access” is required, a place where the blood can leave your body, undergo treatment, then return to your body safely. Early preparation for your Kidney Dialysis will allow easier and more efficient removal and replacement of your blood with fewer complications. The medical staff at Peachtree Vascular Specialists can work with you weeks or months in advance of your kidney dialysis to prepare your access. The “vascular access” is the site on your body where blood is removed and returned during dialysis. 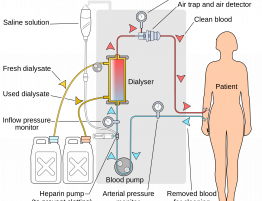 To maximize the amount of blood cleansed during hemodialysis treatments such as kidney dialysis, the access should allow continuous high volumes of blood flow. A fistula is an opening or connection between any two parts of the body that are usually separate—for example, a hole in the tissue that normally separates the bladder from the bowel. While most kinds of fistula are a problem, an AV fistula is useful because it causes the vein to grow larger and stronger for easy access to the blood system. The AV fistula is considered the best long-term access for hemodialysis because it provides adequate blood flow, lasts a long time, and has a lower complication rate than other types of access. If an AV fistula cannot be created, an AV graft or venous catheter may be needed. If your kidney disease has progressed quickly, we can insert a venous catheter as a temporary access if you don’t have time to get a permanent vascular access. The catheter is inserted into a vein in your neck, chest, or leg near the groin. It has two chambers to allow a two-way flow of blood. Once a catheter is placed, needle insertion is not necessary. While catheters are not ideal for permanent access, they will work for several weeks or months while we develop your permanent access. As vascular specialists, we are fully staffed and equipped to meet your kidney dialysis needs. We can create your vascular access and help you care for it during your treatment.